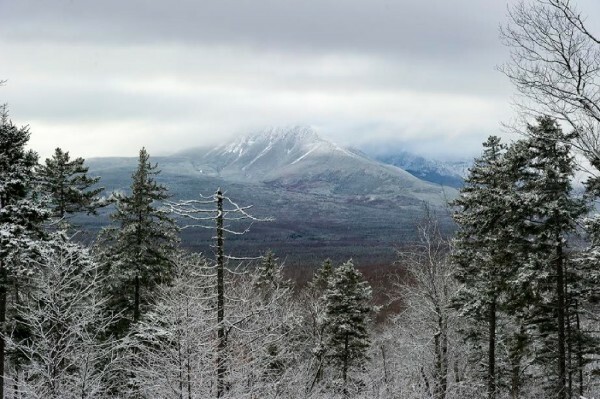 The Katahdin Woods and Waters National Monument offers a spectacular view of Mount Katahdin and other natural beauties in this November picture. 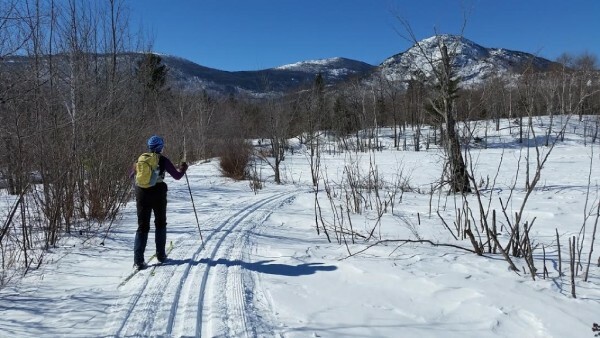 Emmie Theberg and other cross-country skiers have taken to trails within the Katahdin Woods and Waters National Monument that Gov. Paul LePage wants to revert to private ownership or have the state run. Cross-country skier Leslie Burhoe takes a break during a recent jaunt at the Katahdin Woods and Waters National Monument. 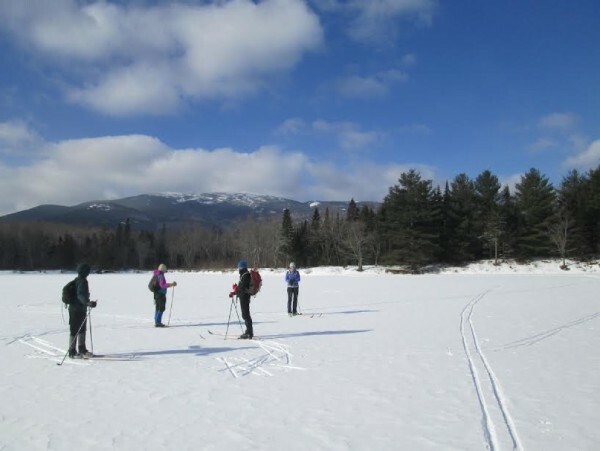 Cross-country skiers Ellen Baum, Cathy Johnson, Bambi Jones and Sheryl Tishman enjoyed the Katahdin Woods and Waters National Monument's skiing trails. 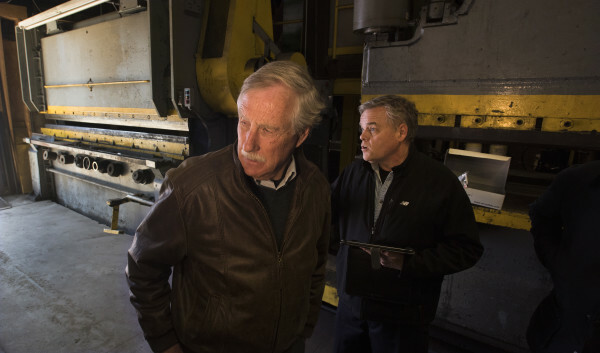 U.S. Sen. Angus King visited a Millinocket foundry in 2016 as part of efforts to assess the Katahdin region's needs. King on Thursday called upon Gov. Paul LePage to stop trying to get President Trump to rescind the Katahdin Woods and Waters National Monument. 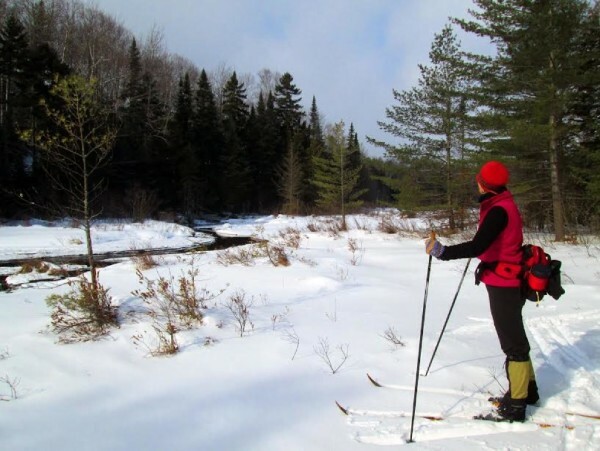 Northern Maine accepts the Katahdin Woods and Waters National Monument and so should Gov. Paul LePage. That’s the message from Maine’s two U.S. senators and Rep. Chellie Pingree in separate statements released Wednesday and Thursday. They said LePage was wrong to ask President Donald Trump to reverse an executive order that created the monument and return the land to private ownership or state management. Republican U.S. Sen. Susan Collins, an opponent of the national park that Burt’s Bees entrepreneur Roxanne Quimby’s has proposed since at least 2011, said on Maine Public Radio Wednesday that LePage’s letter was irrelevant. Pingree, a Democrat who represents southern Maine and supported the monument designation, said Thursday that “the monument has brought new visitors to the area, boosted sales at local businesses, and is helping the real estate market. LePage spokeswoman Adrienne Bennett was unperturbed by the objections of the members of Maine congressional delegation. “There is no change of the governor’s position since he sent the letter,” Bennett wrote in an email Thursday. The White House, Bennett said, has not yet answered LePage’s letter, which was dated Feb. 14. An email seeking comment from the White House was not immediately answered Thursday. U.S. Rep. Bruce Poliquin, a Republican who represents northern Maine, including the monument area, on Wednesday declined to comment specifically on LePage’s letter. He said only that he would continue trying to improve Maine’s economy. Poliquin opposed the monument designation, meeting with White House officials to express his displeasure in March 2016 and hosting a field hearing of a congressional committee attended by Republican U.S. Rep. Rob Bishop of Utah, one of the nation’s foremost opponents of former President Barack Obama’s conservation agenda. Poliquin also proposed a bill, which is pending, that would curb presidential authority to designate monuments. In his two-page letter, LePage asked Trump to enact the reversal “before economic damage occurs and traditional recreational pursuits are diminished.” The Bangor Daily News obtained a copy of the letter Wednesday. Calling Obama’s executive order creating the monument “a grave injustice to the people and our forest economy,” LePage attached a letter from April 22, 2016, detailing his objections to the order. LePage sought state management of the land “to ensure it can benefit all Maine people and accommodate the region’s economic and regional needs” if private ownership was unfeasible. Noteworthy since LePage’s letter was made public has been the lack of publicly expressed enthusiasm for it by the monument’s many opponents. Governing boards or residents of East Millinocket, Medway, Millinocket and Patten declared their opposition to the monument through resolutions or public statements in the months leading up to Obama’s announcement. And in a May 2016 meeting in East Millinocket that King and then-National Park Service Director Jonathan Jarvis held with leaders from East Millinocket, Medway, Millinocket, Mount Chase, Patten, Sherman and Stacyville, opposition to the monument was stark and pronounced. Out of the approximately 75 people in attendance, only two spoke in favor of the monument. When reached Wednesday, two of the monument’s most outspoken opponents, Millinocket Town Council Chairman Michael Madore and Maine Snowmobile Association Executive Director Bob Meyers, declined to comment on the governor’s initiative. Last year, the Maine Legislature passed a bill, signed into law by LePage, that withheld its consent from the federal government to designate land as a national monument. The law was greeted largely as a symbolic gesture, of dubious legality. A possible reason for the groups’ silence: The monument drew 1,762 vehicles for the year, including 1,215 after Obama’s executive order, despite its lack of road signs or inclusion in any significant park service advertising campaigns. The yearly vehicle count exceeded the individual 2010 census estimates of the populations of East Millinocket, 1,723 people; Medway, 1,349; Patten, 1,017; Sherman, 848; and Mount Chase, 201 people. But now that it has happened, she and King said that instead of fighting the monument, LePage should join their joint effort to revitalize a northern Maine economy decimated by paper and pulp mill closures. “What I think is far more important is an effort that Angus King and I have led to have an economic development assessment team come to Maine and work with all the stakeholders, from landowners to loggers to mill owners to recreational business owners, to come up with a plan for our forest products industry to help in this transition where we’ve lost so many of our pulp and paper mills in the last five years,” Collins said. King and Collins announced the federal assessment team’s collaboration with industry players last March. 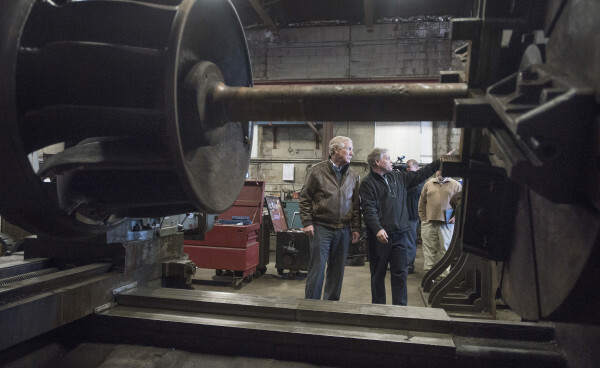 Calling the mill closures “a natural disaster,” they successfully lobbied for several federal agencies to visit Maine last summer, to provide aid in much the same way they would an area devastated by a tsunami. That effort culminated with an announcement at the American Forest Management wood yard in Passadumkeag last month that Oak Ridge National Laboratory — the U.S. Department of Energy’s largest research center — will help University of Maine researchers tackle the future of bio-based materials, including nanocellular technology, biofuels and additive manufacturing, as part of a multi-pronged plan to guide and repair the $8.5 billion state forest products industry. No LePage representative attended the announcement in Passadumkeag. The laboratory has a staff of 4,559 and an annual budget of $1.5 billion. Revitalizing Maine’s forest products industry should be the governor’s focus, Collins said.